Micronesia - IOM’s Pacific footprint has expanded a little further with the opening of a new sub-office in Weno, Chuuk State, in the Federated States of Micronesia. IOM has been operating in Micronesia since 2008 in support of the US Agency for International Development (USAID), in the area of disaster preparedness. More recently, a programme funded by the Australian Agency for International Development (AusAID) focusing on climate change and disaster risk reduction necessitated the establishment of a permanent presence in Chuuk. 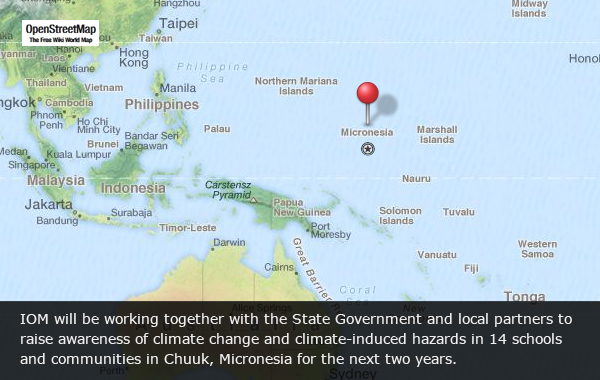 IOM will be working together with the State Government and local partners to raise awareness of climate change and climate-induced hazards in 14 schools and communities in Chuuk for the next two years. It will roll-out of an educational curriculum developed specifically for elementary school students, which includes school evacuation drills, emergency first responders training, assistance with the preparation of emergency preparedness plans and the implementation of adaptation measures. The IOM sub-office in Chuuk will be supported by the Head Office for the North Pacific based in Pohnpei, and will work closely with other sub-offices in Yap State and Majuro, in the Marshall Islands.